Penn Hip Certified top 70’th percentile, distraction index .36 and .32. ASCA Agility titles: RS-N (Novice Regular Agility) JS-N (Novice Jumpers), GS-N (Novice Gamblers)February 19, 2011 First Place ASCA Agility Open Jumpers!H.O.T. Handler owned, trained, and titledPenn Hip CertifiedWhen we picked Wessa up at the aiport, she greeted us happily and then walked with us, unbothered by the hordes of people and the construction workers ceaseless banging. This gal has nerves of steel. She also has drive for work. But best of all, she seems to come with that much desired on/off switch, tirelessly “on” when working, but peacefully “off” when work is done. She has substantial bone and a broad chest. But most important, notice the intelligence and energy of expression. 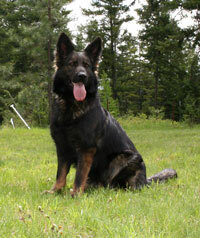 She has those qualities we are looking for in our breeding line.